Fan Tamaill is a lovely thatched cottage situated 2.8 miles from the village of Lettermacaward in County Donegal. This single-storey cottage sleeps six people in three bedrooms, consisting of one double with an en-suite walk-in shower leading to a twin bedroom and there's also a separate double bedroom available. The cottage also has a bathroom, a kitchen, a sitting room with dining area and open fire and a sun room with dining area. Outside there's ample off road parking, a side and rear lawned garden with a stream and a front patio. Fan Tamaill is a charming County Donegal base for exploring the area. The small village of Lettermacaward is on the beautiful west coast of County Donegal. The village has shops, pubs and lovely sandy beaches, with Dooey Beach being remote and secluded, and has great choppy surf, ideal for watersports. A short drive away is the colourful resort of Dungloe, which is a renowned fishing area offering 130 lakes and rivers for fantastic angling. Oil central heating with electric fire and open fire. 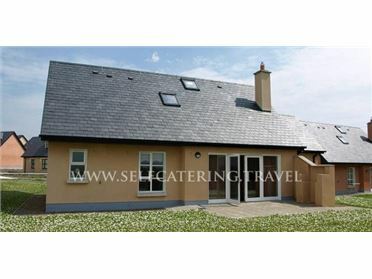 Electric double oven and hob, microwave, fridge/freezer, washer/dryer, dishwasher, TV with Free-to-Air channels, CD/radio. Fuel, power and starter pack for fire inc. in rent. Bed linen and towels inc. in rent. Travel cot and highchair on request. Ample off road parking. Rear and side lawned gardens with stream, swing, furniture and BBQ. Front patio with furniture. Two well-behaved dogs welcome. Sorry, no smoking. Shop and pub 3 miles. Note: This property has one internal step. Note: Due to stream in the gardens, children and pets must be supervised at all times..